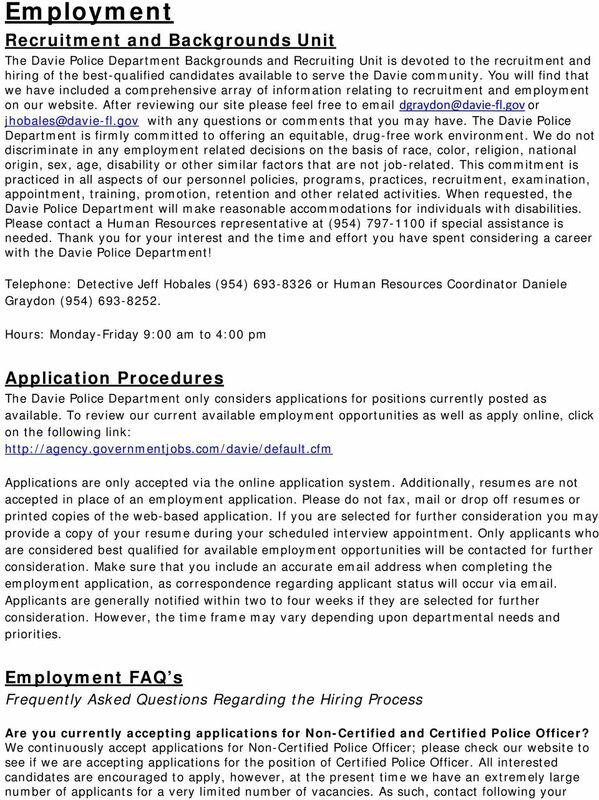 Download "Telephone: Detective Jeff Hobales (954) 693-8326 or Human Resources Coordinator Daniele Graydon (954) 693-8252." 5 Do I have to attend the Police Academy again? You do not have to attend the Police Academy if you successfully achieve the Equivalency for Certification referenced above. How many trips will I have to make to Davie in order to secure employment with your agency? All travel arrangements and fees incurred will be at the expense of the applicant. We will make every effort to create a schedule that meets your travel needs and minimize the number of visits. To receive accommodation, you must have already been contacted by our office based on receipt of your preliminary employment application. FAQ s regarding the Non-Certified Police Officer Position What is the difference between a Non-Certified Police Officer and a Certified Police Officer? 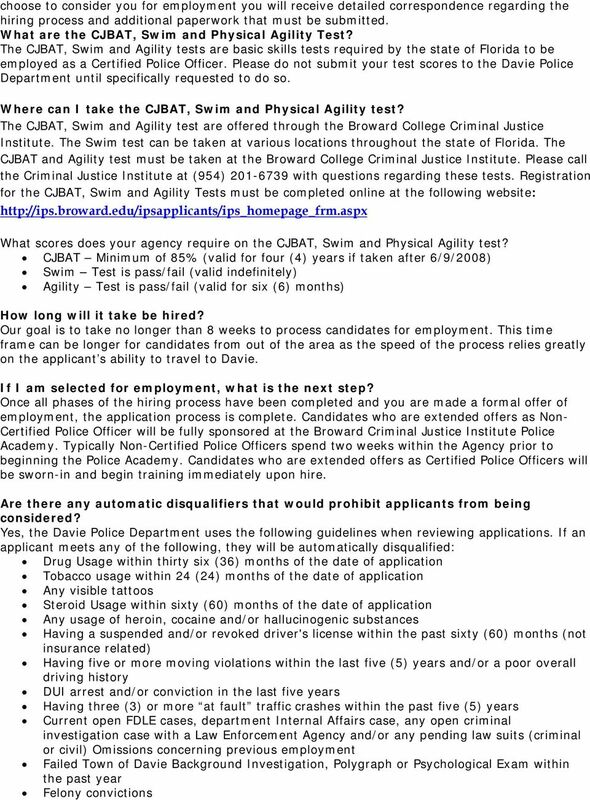 The Non-Certified Police Officer position is designed for candidates who meet the Davie Police Department s education requirement but do not possess the required certification from Florida to automatically qualify as a Certified Police Officer. I would like to become a Non-Certified Police Officer but I am not sure that I want to become a Certified Police Officer. The Davie Police Department only hires Non-Certified Police Officer applicants who are prepared to become Certified Police Officers immediately upon successful completion of the Police Academy and who receive a passing score on the state exam. How long will I work as a Non-Certified Police Officer before I become a Certified Police Officer? Typically Non-Certified Police Officers are hired in conjunction with the start of a new Police Academy class. The duration of the Police Academy is approximately 5 months and as such, Non- Certified Police Officers typically remain in their position for approximately 6 months. Please Note: At the discretion of Administration a Non-Certified Police Officer may be required to work within the department for a limited period of time prior to attending the Academy. This is done specifically to offer additional training and exposure to ensure that the Trainee is best suited to successfully complete the Police Academy. I need Agency sponsorship so that I can attend the Police Academy. I don t even need to be paid. Will the Davie Police Department sponsor me? 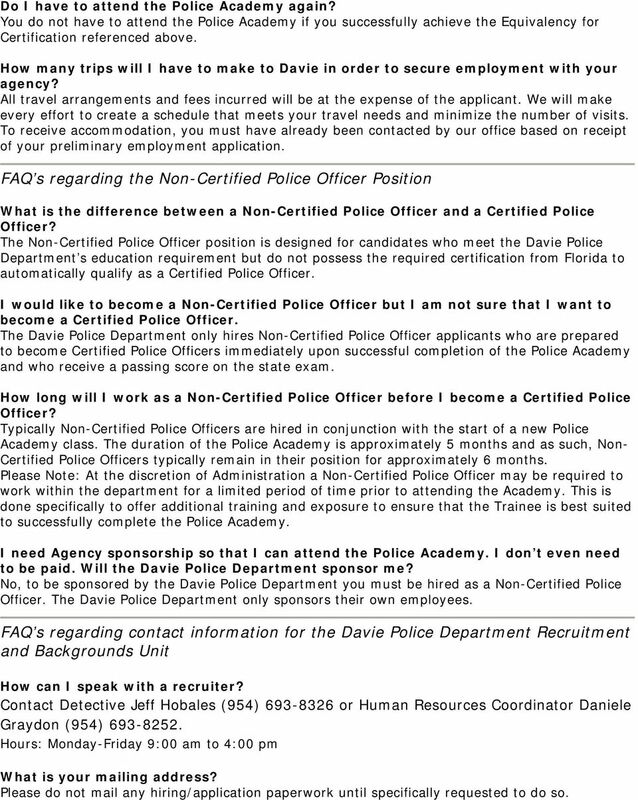 No, to be sponsored by the Davie Police Department you must be hired as a Non-Certified Police Officer. The Davie Police Department only sponsors their own employees. 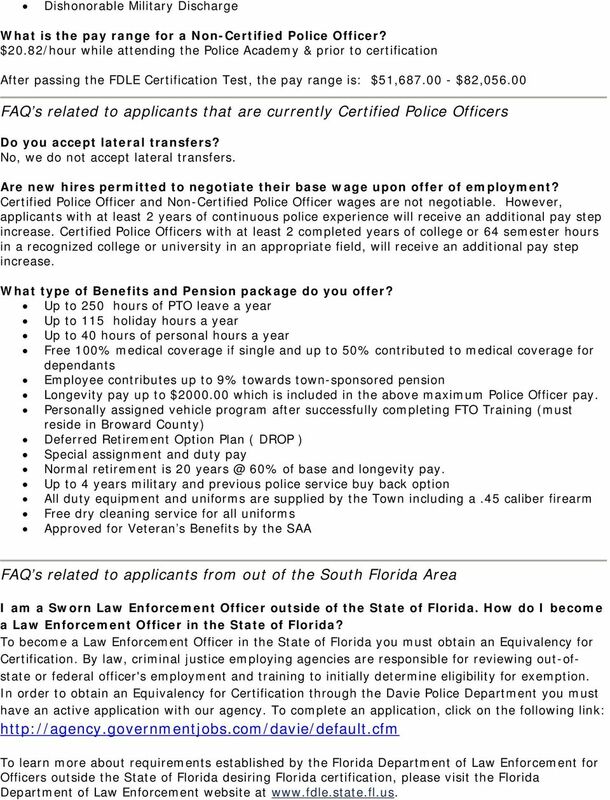 FAQ s regarding contact information for the Davie Police Department Recruitment and Backgrounds Unit How can I speak with a recruiter? Contact Detective Jeff Hobales (954) or Human Resources Coordinator Daniele Graydon (954) Hours: Monday-Friday 9:00 am to 4:00 pm What is your mailing address? 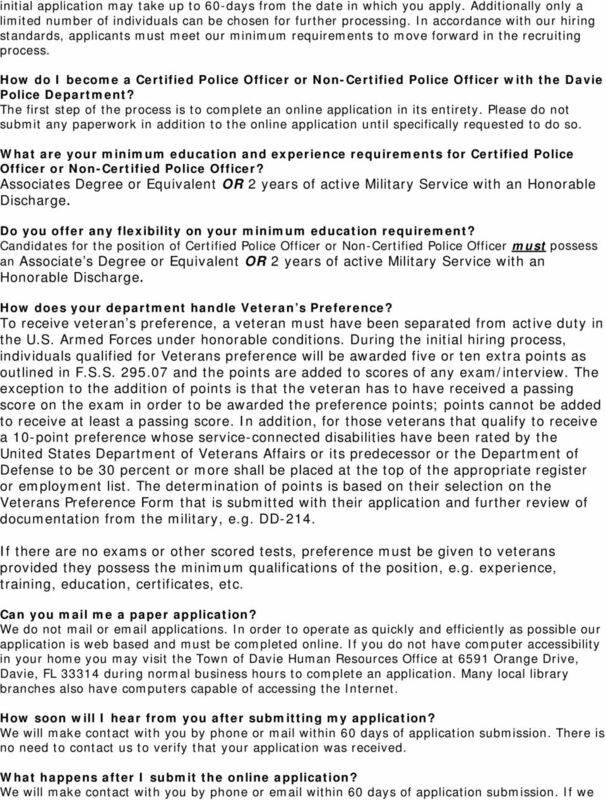 Please do not mail any hiring/application paperwork until specifically requested to do so. Provide important information about our selection procedures Help you determine whether you wish to continue in our selection process. North Carolina State Highway Patrol APPLICATION ORIENTATION PACKAGE Page 2 STATE TROOPER APPLICATION ORIENTATION Minimum Requirements You must be between 21 39 years of age. You must be a U.S. citizen. Indian River County BCC, Human Resources Department 1800 27 th Street, Vero Beach, Florida 32960 APPLICANTS-PLEASE READ CAREFULLY Thank you for considering INDIAN RIVER COUNTY as a potential employer. Trumbull County Sheriff s Office Sheriff Thomas L. Altiere 150 High Street Warren, OH 44481 (330) 675-2508 Application for Employment The Trumbull County Sheriff s Office is an Equal Opportunity Employer. What is the Salary? Trainee (Cadet) - $22,905.36 Per Year based on a 40 hour work week. $1,908.00 Per Month.